Advanced Basement Systems provides free, in-home consultations to assist in radon removal and radon mitigation for your home. Our Radon Mitigation Specialist will schedule a time that is convenient to visit with you. During the time of a consultation, Advanced Basement Systems will conduct a Structural Analysis and Design Survey with you, detailing all the fine points of what goes into a successful mitigation. 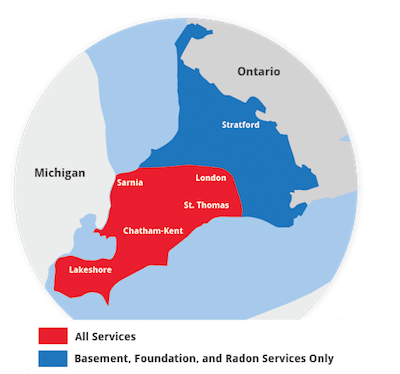 Contact us today for a free radon mitigation quote in the Chatham, London, Sarnia, Windsor, Stratford, Windsor , Leamington, St Thomas, Amherstburg, Strathroy, Essex, Ingersoll, Kingsville, Aylmer, Goderich, Hanover, Listowel and surrounding Ontario area! Advanced Basement Systems' radon technicians are trained extensively on the best practices for properly installing radon mitigation systems to pull radon from within the home and expel it outside the house. Each of our contractors is licensed to perform all radon services and comply with all the radon gas industry's recommended practices to ensure the highest quality solutions have been provided. A final system checklist is performed. The checklist makes sure the system adheres to Health Canada's guidelines . Proper system labeling and proper fan installation is checked, as well as other key steps. Advanced Basement Systems can offer a variety of payment options for your convenience. We know that radon gas mitigation is not always a budgeted household expense, and we'll work with you to make sure that you get the best value within your price options. Don't wait to make your home a healthier, safer environment! Call or contact us today to schedule a radon test or receive a free radon mitigation system quote today! They serve throughout Ontario, including Chatham, London, Sarnia, Windsor, Stratford, Windsor , Leamington, St Thomas, Amherstburg, Strathroy, Essex, Ingersoll, Kingsville, Aylmer, Goderich, Hanover, Listowel.